Strategy pattern is also called policy pattern. Here is a story about Strategy pattern. Suppose Mike sometimes speeds when driving, but he doesn't always do that. He may be stopped by a police officer. It's possible that the police is very nice, who would let him go without any ticket or with a simple warning. (Let call this kind of police "NicePolice".) Also it's possible that he may be caught by a hard police and gets a ticket. (Let's call this kind of police "HardPolice".) He doesn't know what kind of police would stop him, until he actually gets caught, that is, run-time. This is the whole point of Strategy pattern. //defind a method for police to process speeding case. Now we have two kinds of police officers. Define a situation in which a police officer will be involved to process speeding. //the result based on the kind of police officer. Your speed is 10, and should get a ticket! This is your first time, be sure don't do it again! You can compare this pattern with State pattern which is very similar. The major difference is that State pattern involves changing the behavior of an object when the state of the object changes while Strategy pattern is mainly about using different algorithm at different situation. The sort method use different Comparator in different situations. To know more about this method, check out Deep Understanding of Arrays.sort(). You may also want to check out The Difference between Comparator and Comparable. Nice example on the Strategy Pattern. In my blog post, I have taken a dive deep on the Pros, Cons of the pattern. I have also explained about how this pattern can be applied to avoid the need to deal with multiple conditional statements on the client side. I confused about factory pattern and strategy pattern. 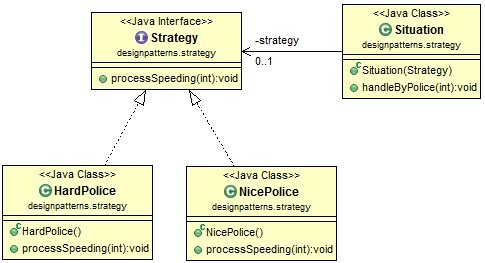 I think they are the same, take your code for example, we also can use factory pattern : there is Police interface, HardPolice and NicePolice implements it separately and there is a factory to get HardPolice, NicePolice. Right? That is why I think they are the same. If that is the case, why we have factory and strategy(not just only factory or only strategy)? I searched about this confusion, someone just say factory is creational and strategy is behavioral. I still cannot understand their difference. Thank you tons for providing an example which is easy to understand/visualize.Very helpful for my learning.